Remember those books? They were all the rage some 17-odd years ago. I remember, when I worked at The Bookstore, we couldn't keep them in stock. A new one would come out and we knew exactly how many to reserve and which customers were sure to pick up the new version. They just needed a call when the book was in. It's a great game to play with the grade school set. It teaches kids to be observant of their surroundings. It teaches language skills and how to be patient. When it's their turn to pick something, and the beginning clue is, "It's blue! ", it can be hard for them not to tell you it's your socks when you guess it's your purse which is clearly visible on the counter. You can tell I've had some experience with this. So, it was with bemusement that I noticed the following. See it? I spy with my little eye, something slender and blue. How about now? How about I say that it's not the Jeep, nor the bumper sticker affixed to the bumper. It's that blue thing in the center of the photo. The pen is a brand we use in the office. I have no idea how long it had been between the bumper and the body. I don't remember why I noticed it, either. Might have been some morning when I was brushing the frost off the back window and I happened to look down. I stared, incredulously, and then had a hearty laugh. I've never said anything to my coworkers about this, waiting to see if someone says, "Um...has anyone seen my pen, anyone, like, oh...I don't know, you, Deb?" So far, and I know I found this back in October, no one has volunteered any sort of clue as to who did this. I thought about leaving the pen there. It would be of value when I'm on a job and forget to bring one. "Oh! Wait right here! 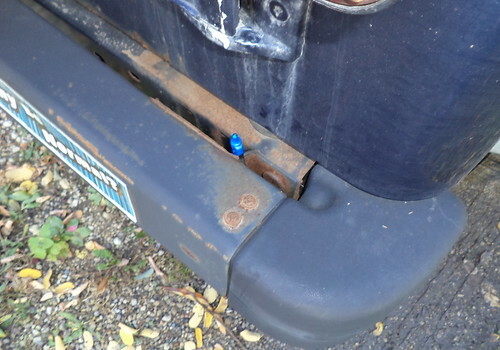 I have one stuck in my bumper for just such an emergency!" The looks, alone, would be worth it. But as we get into winter, with slush and snow, I realized it would probably get broken. That defeats the whole point of leaving it where it is. So, I carry it around in my purse as a reminder that humor is all around us, encouraged by some who wish to remain anonymous.